Integration (CI) or Continuous Delivery (CD) -- have completely transformed how teams develop and deliver applications. Companies that need to compete in today’s fast-paced digital economy must also transform how they test. Successful teams know the secret sauce to delivering high quality digital experiences fast is continuous testing. 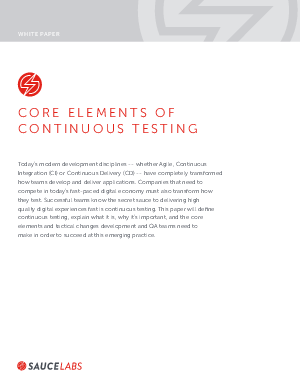 This paper will define continuous testing, explain what it is, why it’s important, and the core elements and tactical changes development and QA teams need to make in order to succeed at this emerging practice.